Canadian comix artist Marc Bell (full disclosure: Bell was a former Exclaim! contributor in the '90s) is best known for his short, surreal strips, but his latest work, for Montreal publisher Drawn and Quarterly, finds him exploring a more long-form format, even if it's a composite of dozens of four-panel, page-long strips. Stroppy is an allegory of class struggle that questions and critiques social mobility, meritocracy and economic privilege, all while telling a story that also pokes fun at taste and authorship in the music industry. 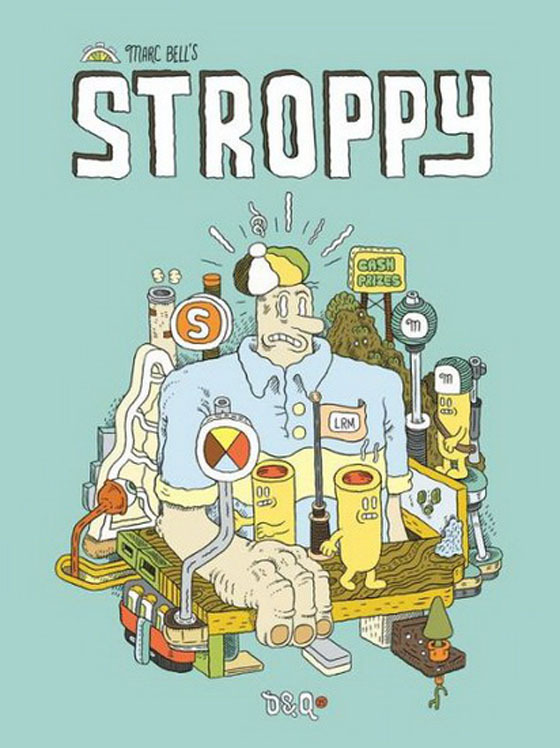 Titular protagonist Stroppy has a crappy, mind-numbing job on an assembly line at the Remote Villager Processing Plant owned by Monsieur Moustache, an incredibly wealthy Mr. Potato Head lookalike that refers to the homeless as "human garbage" and fancies himself a masterful singer and songwriter. Stroppy's work is interrupted one day by Sean, an unpaid intern who works for a cult-like band known as the Shnauzers, who pastes a notice that the band are holding a songwriting contest that will award "cash prizes." When Sean clogs up the works and costs the plant money, Stroppy takes the blame, and is fired, beaten and thrown off the premises. He resolves to win the songwriting contest by submitting his friend Clancy the Poet's poem, secretly and against Clancy's wishes. 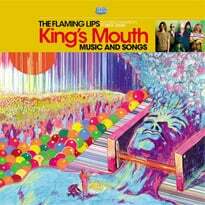 Surreal, pointed hilarity ensues. Each of the three main characters reflect the socio-economic class of which they are a part: Stroppy, a lower class, blue-collar worker, wants to win the contest for the cash prizes; Sean, an upper-middle class type, can afford to work an unpaid internship and values artistry and social standing, and considers himself a "good guy" even when his interests inadvertently cause problems for Stroppy; Monsieur Moustache is an arrogant, deluded one-percenter who tries to buy his way to the contest win, for prestige. The absurd plot, while fascinating, comes secondary to Bell's visual metaphors and his colourful, engaging full-page scenes, composed of jittery black lines, minute details and kinetic energy. It's a pleasure to take in, and the jokes, though subtle, are often as biting as they are clever: visually, Stroppy is always being stepped on and ignored, always as a means to an end; there are references to Pure Pajamas and Shrimpy; by the end, Clancy the Poet becomes trapped and isolated by his fame, fortune and success.